Vacation is something we know and look forward to in our lives. What about workation? The relatively newer term comes with a mixed bag of promises and pitfalls. Some even call it a sad trend of our times. How do we Sri Lankans behave? Are we drifting towards workation in turning vacation also where we remotely work away from the real workplace? Today’s column attempts to share some insights on these aspects. We are living in a changing world where the rate of change is also accelerating. In such a context, consistent performance is increasingly becoming critical. This is particularly true for managers. They are supposed to achieve results in an efficient and effective manner utilising the existing resources, as any management text book tells us. The crux of the matter is that they have to do so, whilst playing multiple roles in professional and personal fronts. Does that really require to sacrifice vacation in becoming workaholics? Will working smart instead of working hard with ample assistance from technology will fulfil the need? Workation comes into to the scene in such a context. As the word itself highlights, it refers to a working vacation. In other words, working remotely while enjoying a vacation. As a recent Bloomberg documentary revealed, it is the latest travel trend. Apparently, entrepreneurs do it more than others in order to ensure survival and sustenance of their endeavours. 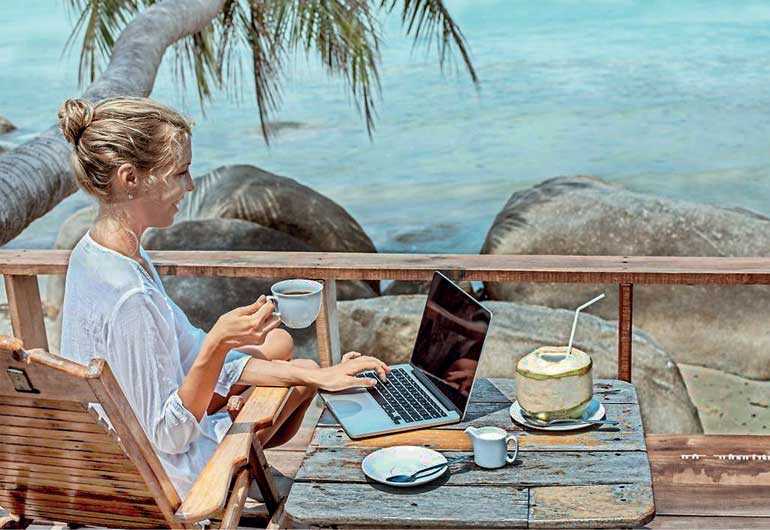 It is increasingly becoming popular among the so called “digital nomads” where working remotely by way of converting where you stay as a virtual office is the norm. How can we determine whether workation is good or bad? For an example, as the Bloomberg documentary discussed, if you have got airfare to Thailand to enjoy the sun and sea, an additional amount of dollars will get you accommodations and access to a beachfront workspace through Digital Outposts, which offers “brand-new facilities including a 50 Mbps dedicated high-speed Internet connection with a redundant 50 Mbps backup”. Have such enticing offers to emerging decision makers become a competitive necessity? How will they affect the work, family and society? To find answers, we have to locate workation in the broad context of harmony in life. Harmony is all about the accord. According to Oxford Dictionary (online), it is the quality of forming a pleasing and consistent whole. It is a pleasing arrangement of parts with congruity. A busy manager dropping off his son to school and coming to work, continue till late evening, whilst being in touch with the family, and enjoying a refreshing Sunday with them could be one such example. It touches a deeper level than the so called “work-life balance”. I would suggest that there are two facets of harmony, inner and outer. Inner harmony deals with mind, body and spirit. 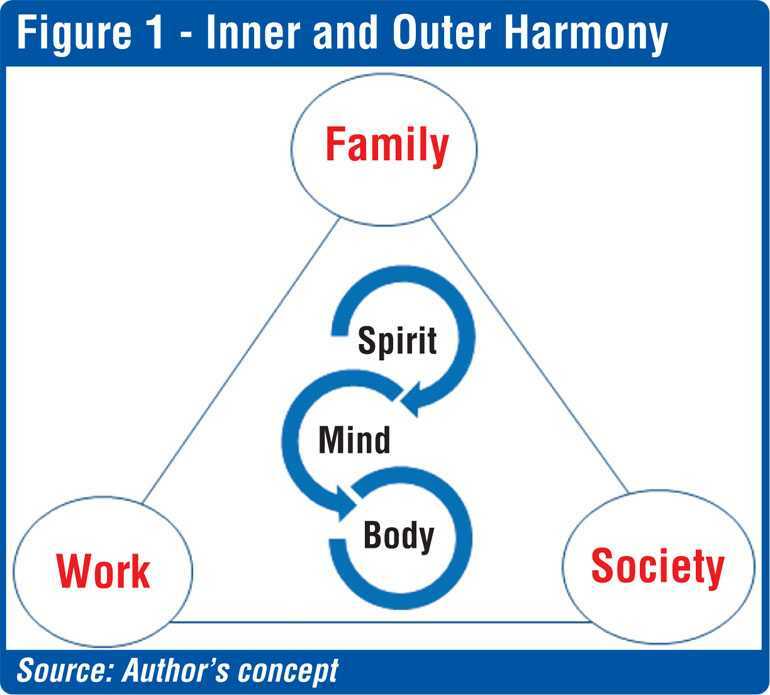 Outer harmony deals with work, family and society. Eastern wisdom is abundant with refreshing resources with regard to inner harmony. Zen has paved the way with practices such as meditation and yoga to sustain such an inner harmony. Loehr and Schwartz (2001) in their seminal HBR article titled ‘Making of a Corporate Athlete’, describe vividly the importance of physical, mental, emotional and spiritual ‘capacities’. This essentially points to inner harmony. The spillover effect of it will facilitate the challenge to achieve outer harmony. Figure 1 depicts such combination of inner and outer harmony. Harmonising work, family and society does not necessarily mean perfection. There will be events that you need to prioritise more on office front. Launching a new telecom product or establishing a new bank branch can be such examples. The deprivation of the family front in such cases should be recovered by paying more emphasis on a priority basis, without interrupting the office front. The situation can be more difficult for a manager following an MBA with demanding academic work. There can be simultaneous peaks occurring such as an upcoming exam, looming project timeline and a sick child at home. It requires understanding between the manager and his/her superiors on one side, and between the loved ones on the other side. That is where institutional support becomes useful, even though not always possible. There is even a macro level where political, economic, social, technological, environmental, legal and ethical (popularly known as PESTEEL) factors come into the scene. The challenge here is to maintain the inner and outer harmony within the macro factors that can be favourable or unfavourable. In moving further, it is interesting to see how the inner and outer harmony contributes to ‘work in life’ and ‘life in work’. This essentially refers to locate work meaningfully in the broad sphere in life. In this respect, the twin terms, Niskam Karma (NK) and Sakam Karma (SK), offer valued insights. As reported by Chakraborty and Chakraborty (2006), NK is a term derived from the revered Hindu text Bhagawad Gita. It literally means detached involvement. Performing work, accepted on the basis of agreed remuneration, with little calculation or comparison with others, or concern for additional personal recognition, gain or reward during or completion of the work. A verse in Bhagavad Gita enunciates the principle of NK as follows. The opposite of NK is termed as SK meaning attached involvement. As Chakraborty and Chakraborty (2006) elaborate, it means performing work, accepted on the basis of agreed remuneration, with anxious comparative calculation vis-à-vis others, for additional personal recognition, gain or reward during or on completion of the work. It by no way means one has to leave the worldly affairs in becoming an ascetic. As Sri Aurobindo aptly pointed out, “action done with NK is not only the highest, but the wisest, the most potent and efficient even for the affairs of the world”. A desirable scenario would be to see the engaged employees becoming detached, yet continuing to be involved. A simple example could be, a bank manager devoting himself/herself for the achievement of the given objectives, in a whole-hearted manner, without thinking of what one would get in return. The opposite of this will be another manager working hard on a personal agenda, aspiring to get the next promotion early. The acid test here is the ability to be ‘detached’ yet getting involved, particularly in the professional front of life. The much-published statement by former US President John F. Kennedy, “ask not what your country can do for you, but ask what you can do to the country”. Such an approach is very much relevant to a wide variety of institutions, in order to build employees who are ethical and effective. What I mean here is the liveliness that is required at work. In other words, it is about showing interest and enthusiasm at work. The closest resemblance I found to this is the term, employee engagement. It has become a buzz word in management circles, mainly due to its attractiveness as a tool in getting work done. What do we mean by employee engagement? It captures the essence of employees’ head, hands and heart involvement in work. It refers to employees’ psychological state (e.g. one’s identification with the organisation), his/her disposition (e.g. one’s positive feeling towards the organisation) and performance (e.g. one’s level of discretionary effort). In brief, it captures affective (feeling), cognitive (thinking) and behavioural (acting) dimensions of an employee. There are many corporate examples to show how employee engagement is measured from the answers from employee surveys, viz. say, stay and strive. In the case of Sri Lanka, many best practices can be found where focused effort towards engaging employees had yielded results. Despite the scarcity of documented evidence, efforts are being made in this front, with vision and vigour. One common characteristic among the winners of many HR awards at national level has been the sustained focus on employee engagement. However, the scope is vast and the continuous improvement path remains widely open. Do we have evidence that we exhibit inner and outer harmony as essential for managers to achieve and to enjoy? Perhaps we are in a journey towards that but not yet fully there. Increase digitalisation, on one hand, has paved way to connect with loved ones who are physically away. It, on the other hand, may direct people to work, deviating them from a well-deserved vacation. Wider use of smartphones not only to stay in touch with mails but also with apps to monitor business tasks paves way for more workations. The key lesson for us is not to harm the harmony. I refer to both the inner and the outer as we discussed earlier. Even if workation becomes a necessity at times, it should not be the preferred way of spending leisure time. That’s how we need to appreciate ‘work in life’ and ‘life in work’. In essence, let a deceptive workation not overshadow a deserving vacation.